When you’re looking at streaming services, you really need to make sure that you’re picking one that features loads of your favorite shows, so if those are all on CBS, then our CBS All Access review is the thing to read before you take that final step. CBS All Access is a great platform that offers CBS fans access to live TV, as well as loads of TV series, and movies. Even though it’s only been around since 2014, there are already a couple of million subscribers. 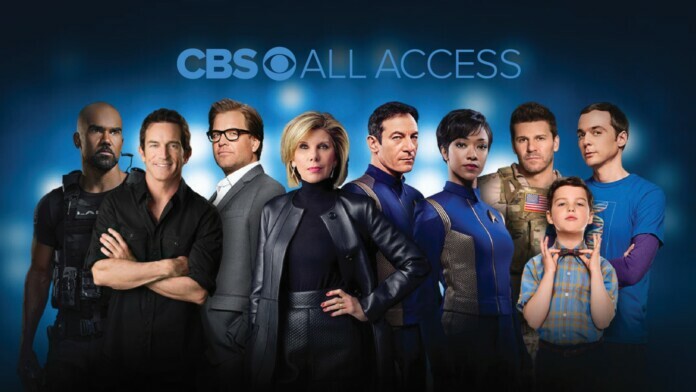 Before we kick things off, let’s see a few highlights of this platform so you know a few basic things about CBS All Access before we go into detail and dissect the platform. Availability Available in the United States since 2014, in Canada since April 2018. Now that we’ve gone over these, let’s see what the pros and cons are in our opinion. The platform has been around for a while, even though it’s brand new for Canadians. That being said, it’s a great place to watch all your favorite shows, like NCIS, or Criminal Minds, to name just a very few. But we’ll get back to this in a bit. So, CBS All Access is only available in the United States and Canada, which means you have to be on these countries’ territories to watch anything. That being said, it’s completely possible to watch it even from abroad if you have a VPN. We’ve tested it out and we can say that ExpressVPN is a safe choice. CBS All Review is available on pretty much any device you may have in your home, from smart TVs to gaming consoles, or phones. 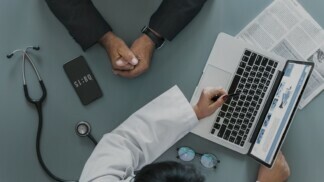 It’s really a very inclusive platform and should be appreciated for that because there are many similar services out there that have failed to launch apps for various important platforms. That being said, here are the supported platforms and devices. 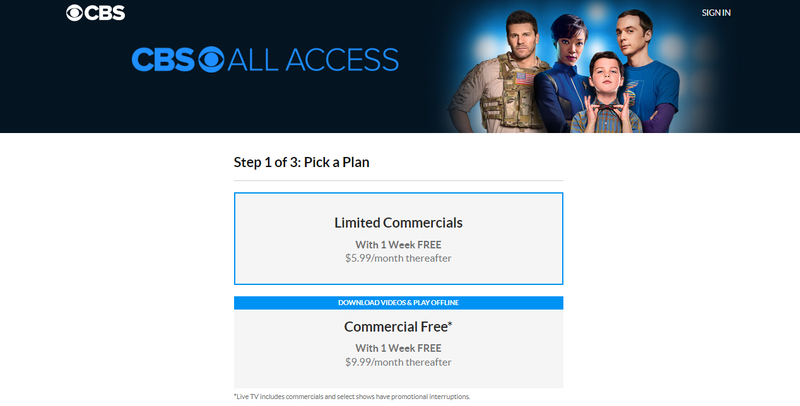 In order to sign up for CBS All Access you have to provide some info of yours, but nothing you don’t expect from this type of services. You start up by picking out one of the two plans – Limited Commercials, which is $5.99 per month, and Commercial Free, which is $9.99 per month. The latter also allows users to download videos and play content offline, but it does include various commercials during the Live TV. Also, if you choose an annual plan, you get 15% off. More specifically the Limited Commercial subscription costs $59.99 per year, while the Commercial Free subscription costs $99.99 per year. It should also be mentioned that all subscribers get a 1 week free trial period, so you only get charged once that week is up. You can choose to pay with a debit/credit card or PayPal. 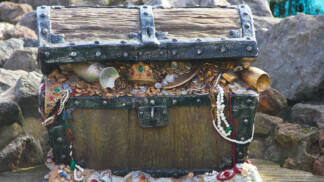 The site is quite easy to navigate, and so are the apps. In the upper side, you’ll find a ribbon that features the various categories on the site – shows, full episodes, live TV, schedule, movies and so on. There are dozens of shows you can access from the drop-down menu, and for each of them you can also check out photos, read news, and learn about the cast and the show. It’s all neatly tied together and anyone can figure it out. CBS All Access is home to loads of cool content. There are literally dozens of shows you can watch, from oldies like 7th Heaven and MacGyver Classic to current shows like Bull, NCIS, The Big Bang Theory, and Hawaii Five-O. 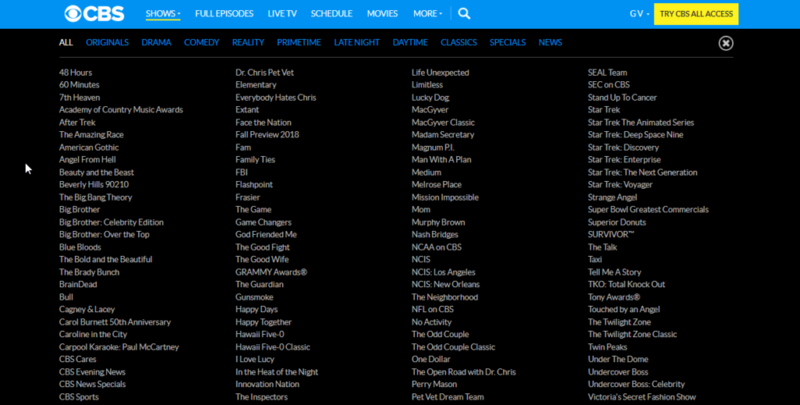 In the “Full Episodes” tab you’ll find the latest episodes broadcast by the CBS, some of which are even free to air. The Movies category could use a few more films since it’s pretty thin. At the time you can watch movies like Footloose, Four Wings and a Funeral, and Throw Momma From the Train. The CBS All Access site works just fine for every device we’ve tested. The streams work fine and they’re quick to load and we haven’t seen any buffering. Then again, we have pretty good Internet speeds, so that might have helped. The minimum requested by CBS All Access is about 3 Mbps for a trusty connection. You can also watch videos on up to five different devices, which is good to know when you have a large family. When trying to get help in regards to CBS All Access you should, obviously, start with the Help section. There are so many questions answered in there. In fact, it may very well be one of the most extensive Help sections we’ve seen thus far, or maybe it’s just because we’re impressed with the number of entries. If that doesn’t work, you can contact the support team directly via a message left over the site. There’s also an available phone number you can call Monday through Sunday between 8 AM and 2 AM ET. It may not be exactly around the clock, but we’re sure nothing can be so tragic that deems necessary a call in the middle of the night. You can pick one of two subscription models. One will give you access to the content for $5.99 per month, but there will still be some ads in there. The other will cut out the ads and that will cost you $7.99 per month. The ads that appear during live TV broadcasts are there to stay and there’s nothing you can do about that. There’s even a 15% price cut if you want to pay for a whole year. We didn’t give CBS All Access the full stars here mainly because it’s only one network. You pay a similar price for Netflix access which offers a lot more content. 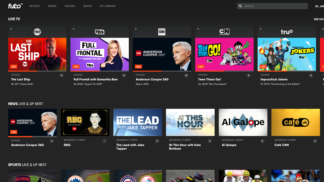 While over-the-top platforms like DirecTV Now, fuboTV, Sling TV, and so on can be even ten times the cost of CBS All Access, they cover both live TV access and VOD content from dozens, even hundreds, of channels. In the end, it just depends on how many CBS shows you love and if it’s worth it to try it out. This is a pretty neat platform all around, from presentation to price, to content and it features some of our favorite shows, so that’s always a plus in our book. More content is always added as new episodes air and since the fall season is just kicking off, you’re going to see more and more premieres. CONS: It’s only one network. We can say that we thoroughly enjoyed CBS All Access from start to finish. Not only does it have some great content, but it’s easy to use, and it’s not too expensive either. If you have any questions, feel free to drop them in the comments section below. Please share the article with others, maybe they’ll try out CBS All Access too. Follow us on social media, on TechNadu’s Facebook and Twitter pages. CBS All Access is a great platform and you should definitely give it a try if you love the network's shows. 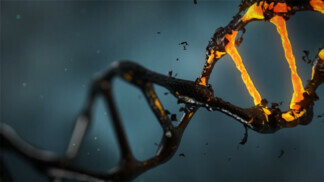 We certainly had a good experience while testing it out.